Lumbar microdiscectomy in Spain, Europe could be of value to people who do not mind travelling across the borders for good healthcare. A lot of medical tourists going to Europe are well aware that in this continent, the approach to spine surgery is quite aggressive. Because of this, European neurosurgeons and orthopedic surgeons performing this type of surgery typically have much more experience than their North American counterparts, which is a great factor for patients when choosing the surgeon who will perform an operation on a very delicate structure like the spine. Lumbar Microdiscectomy abroad is also the preferred choice for people, who are beleaguered by spinal problems, but are unable to secure an easy appointment with their doctor back home. Microdiscectomy is also referred to as microdecompression. It is usually recommended to patients suffering from increased pressure on the nerves in the spine due to herniation of a disc in the lumbar area. The compression on the nerve root may cause severe leg pains. The back muscles covering the spine are moved away to uncover the structures needed to be seen during the surgery. After the removal of a membrane that covers the nerve roots, the surgeon then uses special operating glasses or microscope in order to see the nerve roots. A tiny part of the inside facet joint is then removed to relieve the pressure on the nerve. Gently, the surgeon moves the nerve root to the side, then the disc material is removed from under it. Ligaments and muscles are left intact while this procedure is performed, so the mechanical structure of the lumbar spine remains unchanged after surgery. Even abroad, the microdiscectomy procedure can be performed on an outpatient basis, or with a short 1 or 2 day stay in the hospital. Most patients are able to return to normal daily activities a few days after the surgery, but most surgeons will recommend less strenuous movements of the spine that may require bending or twisting. This heavy movement restrictions are usually only for the first 4-6 week, after which the operated area would have healed nicely and would be able to accommodate more movement. Most patients also receive a specialized exercise program to strengthen the back and prevent further occurrence of disc herniation. The quick recovery time of this type of spine surgery is ideal for those medical tourists in Europe who want to do tourist-related activities while in the area. As long as no heavy back bending or twisting is done, the patient should be able to go around the place and explore to his heart’s desire. 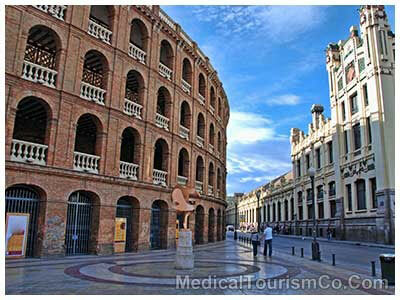 Considering Spain for Lumbar Microdiscectomy? A patient who has been experiencing leg pain for more than 6 weeks. This is because if a patient’s leg pain is due any other reason, there is a chance that it will get better within this period. Patients are advised to always exhaust all treatments available before resorting to back surgery. Conservative treatments that may be recommended before deciding on undergoing surgery are: oral steroids, physical therapy, NSAIDs, and other medication for pain. If these methods do not work, spine surgery has to be considered within the next 3-6 months as they will have more favorable results than when surgery is delayed for longer than that. X-rays and MRIs are usually done to isolate the problem, the same images a spine surgeon in Europe will require in order to evaluate the patient’s case and suitability for surgery. While lumbar microdiscectomy is very straight-up and with rare or no significant complications reported over the years, there are also risks as with any other surgery to the spine. 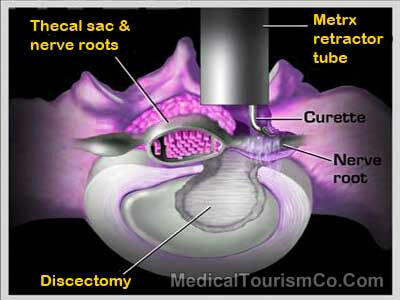 Micordiscectomy is also called microdecompression surgery, while laminectomy is alternatively known open decompression. While lumbar microdiscectomy is mainly to alleviate leg pain due to neural impingement because of a herniated disc, lumbar laminectomy is done to alleviate pain caused by spinal stenosis. Spinal stenosis, the typical cause of a condition resulting to a laminectomy, happens when degeneration occurs in the spine so that the facet joints are enlarged. These then exert pressure onto the nerves, which causes pain. The main difference between the two procedures is that laminectomy takes a longer recovery period (2-5 days) in the hospital because more muscle stripping is done during the surgery, and the incision is also longer. Medical tourism in Europe, specifically Spain, is gradually picking pace, as more and more people realise the healthcare potential of this country. The spine centre in Barcelona is an excellent facility housing top of the line medical equipment that ensures operations go as precisely as planned, keeping in mind the safety and security of spine surgery patients. International patients to Spain are also very comforted by the fact that they do not have to pay exorbitant amounts to avail of these high quality services, as most prices are more affordable than those found in other European countries and in North America. Another draw for international patients is the fact that most of these neurosurgeons have trained or worked abroad, so they are very used to dealing with patients with different cultural backgrounds and nationalities. Going for a medical trip can be stressful from the planning stages, so consider availing of a good medical tourism agency to help out with medical appointments, virtual consultations, and logistics. A good medical tourism agency will have access to packages that will include all costs related to the surgery, and most of the time, a short hotel stay after surgery. Additional needs like accommodation and transportation while in the country can also be arranged depending on a client’s requirements. Research about the credentials of the surgeon you are interested in. You may also seek some former patients who can give you some feedback about the services, and the surgeon. The most important thing to remember is to not hesitate to ask questions while gathering all the information you need for the trip. It is vital that a patient is comfortable with the team, and knows that his needs are being looked after. Lumbar microdiscectomy in Spain, Europe can be a scary prospect for a patient who has to leave his home country and be treated by foreign doctors, but knowing that you are working with qualified medical professionals, who have your health foremost in their minds, is comforting and encouraging. So openly discuss your concerns, ask questions, and insist on direct answers, because you deserve nothing less.